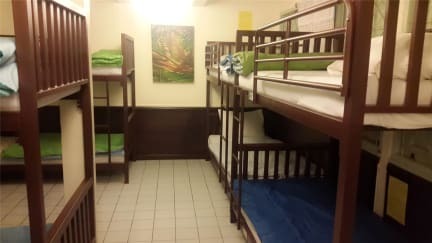 GREEN HOUSE is a guest house and dormitory right next to the world famous Khao San Road. Conveniently located close to a local landmark, the Viengtai Hotel on Soi Rambuttri, the 80-room guest house is open to all nationalities and offers clean, functional budget accommodation with a wide range of options of rooms including single, double and triple air-conditioned rooms with en suite bathrooms or shared facilities. GREEN HOUSE offers one of the best restaurants in the area with great ambiance. A full international menu with great middle-eastern and Thai food is washed down with a full wine list, a well stocked bar including cocktails and a good range of cold beers! GREEN HOUSE is a great place to meet people and a great place to stay! Check it out! 5. You may pay cash or credit card upon check in, however, we charge 3% for VISA and Mastercard. We only accept VISA and MASTERCARD. 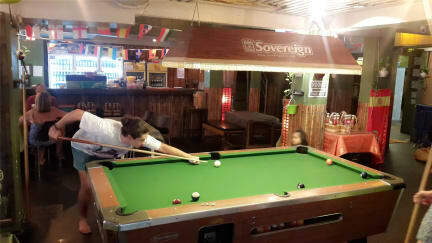 We were totally satisfied- nice place right next to the Khaosan Road! We recommend this hostel! War für den Preis ok. Einmal ist mir ne Ratte über den Weg gelaufen. Wurde glücklicherweise nicht zur Gewohnheit. Lage war super und preis auch. Aber Nachts sehr laut. 1. Zimmer war sehr abgelebt. Ersatzzimmer war super. Dusche war kalt. Und überall Ratten im Erdgeschoss. Auf der Straße und hinter der Bar und auf der Theke. Liegt daran, weil dort alles offen ist und unten ein Restaurant drin ist. Und keiner macht was gegen die Ratten. Nachts war es besonders schlimm. Liegt aber auch an dem Stadtteil. Ansonsten wars okay für den preis. Sehr unfreundliches Personal. Zimmer sind einfach gehalten. Schlafen ist durch die Nähe der Partystraße kaum möglich. Eine der schlechtesten Unterkunft in 6 Wochen Asientour.